Home » Uncategorized » Workout Routine – Organize Your Program and Stay Off the Lame Excuses! Workout Routine – Organize Your Program and Stay Off the Lame Excuses! Nothing is more beneficial for a weight loss enthusiast than having a well-organized and easy to follow workout routine. Benefits are totally for your reaping once you have learned the best way to organize your workout sessions. The main reason why many people give up even before adding two inches to their build ups or losing significant weight is that they often complain about their physiques not improving after having numerous sessions at the nearby gym. In fact, the truth behind these complaints is hidden in the order as well as the organization of their workout sessions. Most beginners often make the mistake of doing all the exercises for the chest, the arms, the legs, the abs and cardio exercises all in one session. This truly is a sweaty and taxing activity. Take notice that this mistake often leads to fatigue, injury and muscle tears. It is essential to take the organizational workout routine for the best results. There are many ways in which you can sort your exercises. The very first example is to divide them in two, which includes the type of movement you perform. In this case, these are the push and pull movements. Pushing movements like bench presses, squats and dumbbell presses can be performed in one routine. But, you must also make sure the at least two exercises are performed for each body part, like the chest, the shoulders and the legs. Let me emphasize once more that the weight should start at a light and slow pace to moderate. Going in an all out heavy lifting or exercise may lead to injury. The other movement includes the pulling activities which are mostly for the back muscles and the rear deltoids. You can divide these two types of routines within two days with rests in between the workouts. Another routine is to divide them according to the body part you are about to train. Exercises will be performed for the chest on day 1, the back for day 2, on day 3 the legs and so on. You may also incorporate cardio exercises as your warm up with every session with a maximum of thirty minutes total. 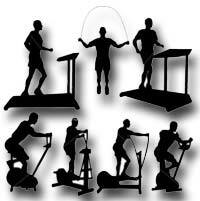 Another method is to assign a day for your cardio workouts with a maximum of two hours of training. Always remember to incorporate a day of rest in between your workouts to achieve maximum recovery of your muscles as well as recuperation for your energy to be used for the next workout session. There are is certainly no shortage of how to lose weight tips, but properly organizing your workout routine is a very important one that you shouldn’t overlook.